Ti-6Al-4V is the nominal composition of titanium alloy Grade 5 which is the most widely used titanium alloy grade. A lot of other titanium alloys are improved version of this grade. It accounts for 70%~80% of world’s titanium market. Ti-6Al-4V, UNS R56400, is a typical alpha+beta alloy which is primarily furnished in annealed condition. It has useful creep resistance up to 300°C [570°F] and excellent fatigue strength. It can also be used for cryogenic applications at extremely low temperatures. 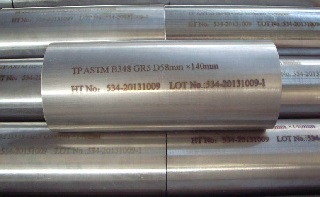 ASTM B348 Grade 5(Ti-6Al-4V), round bards, o.d 58 mm x 140 mm length. Ti-6Al-4V has good corrosion resistance to atmosphere, oxygen, seawater, as well as pure hydrocarbons. It can be produced by metal or remelting process such as vacuum arc remelting(VAR), electron beam(EB), and plasma arc hearth melting(PAM), etc. Ti-6Al-4V alloys can be used for a variety of applications such as aircraft gas turbine disks and blades, airframe structural components, oil and gas offshore platforms, bolts & nuts, and surgical implants, etc. They are available in product forms of strip, sheet, plate, bar, rod, tube, fitting and forging. *All values are in weight %; *Other1: maximum each of other elements; *Other2: maximum total of other elements. *The mechanical properties for ASTM B348 Gr.5(Ti-6Al-4V) bars, annealed. *Mechanical properties may vary in different product forms, sizes and heat treatment conditions. 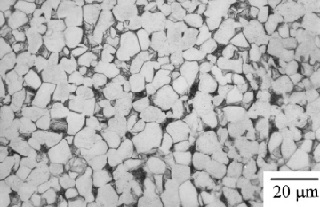 Microstructure of Ti-6Al-4V (titanium alloy Grade 5), α+β alloy, annealed condition. Ti-6Al-4V is a typical α+β alloy. 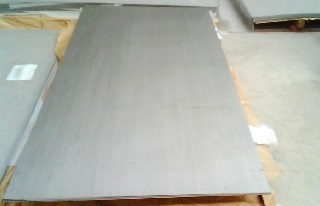 Aluminum is the primarily alpha stabilizer in this titanium alloy. It increases tensile strength, creep strength, and the elastic modulus. Vanadium is a beta stabilizer which is completely miscible in the beta phase. Ti-6Al-4V sheet, 3 mm thick, ASTM B265 Gr.5. Density: 4.5 g/cm3; Melting range: 1536°C~1650°C; Beta transus temperature: 1800°F~1850°F; Electrical resistivity at room temperature(73.4°F): 1053 ohm-cir-mil/ft; Modulus of elasticity: 110 GPa; high strength to weight ratio. Price for Ti-6Al-4V sheet(ASTM B265 Gr.5, annealed): USD20.85 per kg. Price for Ti-6Al-4V bar(ASTM B348 Gr.5, annealed): USD21.20 per kg. All referenced prices are based on FOB Xingang Port.